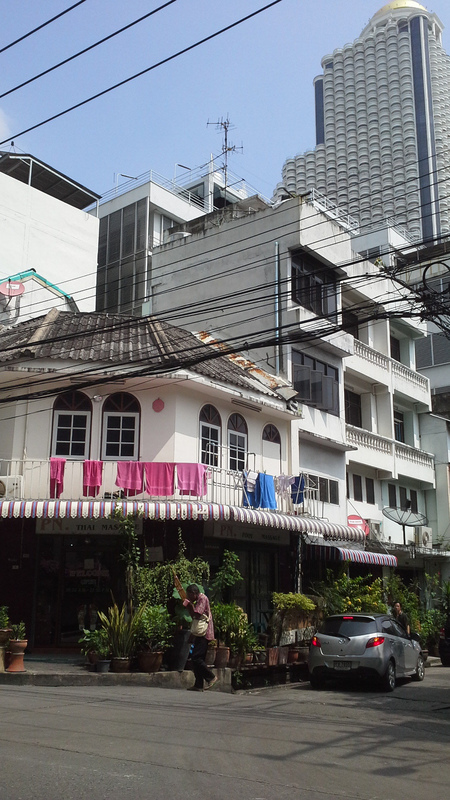 While most of Bangkok is a modern high-rise city, there are still a few corners left with historic buildings. With a day to kill before my flight home to Auckland, I went for a walk to check some out. 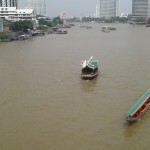 The oldest part of the city is along the Chao Phraya river front where Europeans and other foreigners settled in the 19th century. I travelled a bit further on the underground than yesterday, then transferred to the sky train. The security officer today was a young woman, and I was on my own, so when the alarm went off I cooperatively placed my backpack on the inspection table and opened the zip. She was obviously a bit embarrassed at stopping me, but she turned on her torch as she had been trained and shone it in the direction of my bag from about a metre away. She might have spotted a football sized bomb with a burning fuse like you see in cartoons, but I could have carried just about any other weapon. The skytrain winds its way through the skyscrapers, offering a fine view of the downtown areas. 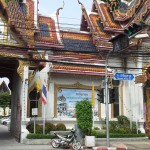 I disembarked at Saphan Taksin station and began exploring. 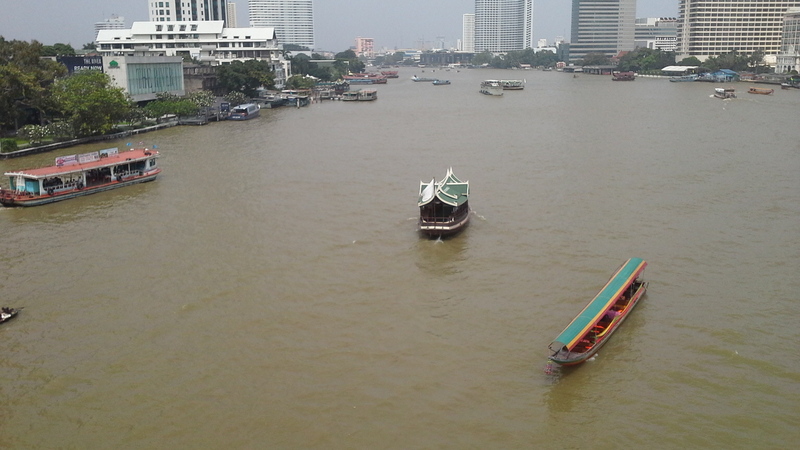 I started by climbing up onto the Taksin bridge and watching the river traffic for a while. It would be nice to do a boat tour one day, but I figured I’m going to be sitting down more than I want to be in the coming hours. I had a chuckle to myself when I noticed a helpful sign erected by the council pointing the way to the Shang Rila hotel. The guide suggested visiting a market, without giving very specific directions, but I eventually found it tucked away behind a lot of apartments. 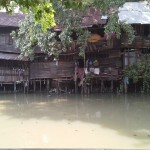 It is obviously where the locals do their shopping, because it doesn’t cater to tourists. 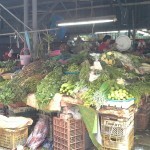 The selection of interesting greens in my photo made me wish I could shop here for our own kitchen. 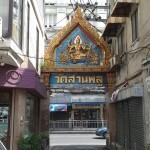 There are Buddhist temples everywhere in Bangkok, but I saw one that caught my interest because the name translates as “Temple of Junk”. It turns out to be an early attempt at building boats out of concrete – the one that you can just make out through the gate weighs hundreds of tons and isn’t going anywhere. 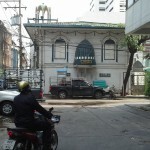 The rather unimpressive mosque is one of the oldest in the city, build when people from Java came to live in Bangkok. There is still quite a big Muslim community in this area of town. Around the next corner I found saw one of the surviving shop-houses with a modern apartment building towering into the sky behind it. The old man in front is playing a kind of bamboo flute. I thought I had found a Hindu temple when I photographed the figure over the gateway. But the temple behind me was definitely Buddhist. It sure looks like Shiva to me. The is also a big Catholic church, but I thought it was architecturally fairly boring in spite of being build out of imported European materials. 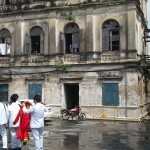 The very old dilapidated building used to be the Custom House. It is now being used as a fire station, and is also obviously popular as a photographic back-drop. The water on the ground is because it is below river level, and the stopbank isn’t watertight. 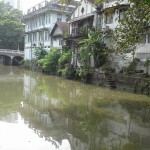 The last part of the walk followed a canal (or klong). The bridge is a historic monument. Some of the houses alongside looked pretty historic too, but I don’t expect they are going to be there much longer. I decided to lash out and eat lunch at a restaurant in an alley with tables and chairs. Fried rice with prawns cost nearly NZ $2.40 – it’s a lot less painful than eating out in London, that’s for sure. The security at the airport that I’ve just been through was the most zealous of this entire trip. I had to take my boots off, and they x-rayed my bag three times before confiscating a tiny pocket knife with a 40mm blade that has passed through dozens of inspections before.